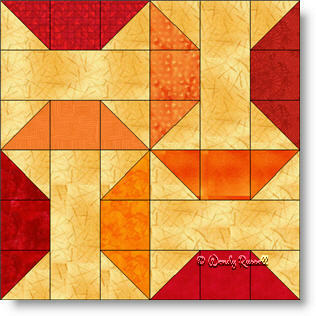 The Autumn Puzzle is a simple four patch quilt block featuring only the most basic shapes in quiltmaking -- squares, rectangles and half square triangles. The added surprise is that these shapes work together to form pinwheels. The two sample quilts illustrated also use only basic settings for your blocks -- a side by side layout which makes the pinwheels form sort of a secondary pattern, while the on point setting gives you ample room to do some fancy quilting stitches in the blank blocks.